Researchers at the University of Southampton are pioneering the use of wireless sensors to study a little-known phenomenon that affects the movement of glaciers. 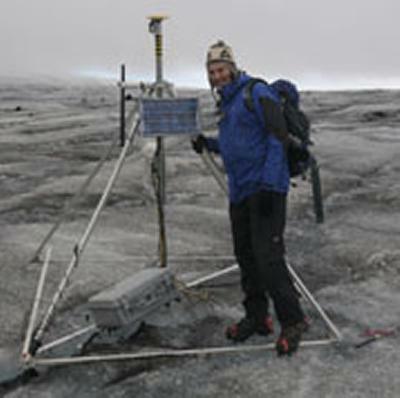 Professor Jane Hart from the School of Geography and Dr Kirk Martinez of the School of Electronics and Computer Science (ECS) have been awarded a Leverhulme Trust Research Project Grant to study glacier ‘stick-slip’ motion as it affects the Skalafellsjökull glacier in Iceland. According to the team, scientists know surprisingly little about ‘stick-slip’ motion, the term given to the events which cause ice sheet movement, and occur in the normal course of glacier sliding. To measure the ‘stick’ phase, the researchers plan to use an innovative wireless multisensory probe, which they developed to use on Glacsweb, a project which deployed the world’s first wireless probe to measure in-situ processes at the base of a glacier in Briksdalsbreen, Norway.